James Charles Bethke was born on November 5th 1946 in Falls City, Nebraska. The six foot right hander was signed as a bonus baby by the New York Mets in 1964. After one season in the rookie league & A ball he was invited to Spring Training 1965. He did well enough for the desperate Mets to give him a shot in the big leagues. Bethke was the youngest player in the league at age 18 & 26 years younger than team mate Warren Spahn. The six foot three, right hander had a great fast ball but poor control. He made his debut finishing off the Opening Day loss to Don Drysdale & the Los Angeles Dodgers. 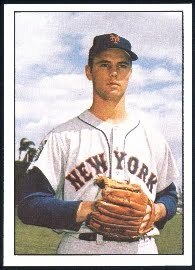 On April 15th he came in to pitch in the top of the 10th inning of a 4-4 tie in a game at Shea Stadium against the Houston Astros. He walked Joe Morgan & then got Al Spangler to ground into a double play. The Mets won the game & Bethke earned his first win as Bobby Klaus hit a walk off HR. On May 2nd Bethke earned his second & final career win, when Ed Kranepool singled home the winning run in the bottom of the 9th inning after he had pitched two scoreless innings. That year he also spent some time at AAA Buffalo going 1-5 with a 5.70 ERA. For New York he was 2-0 with a 4.28 ERA finishing up 12 games making 25 appearances. 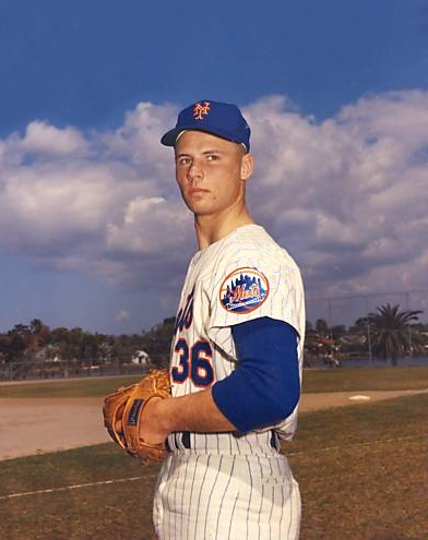 Bethke would never pitch in the major leagues again, he pitched in the Mets minor leagues through 1970 & then finished his career in the Kansas City Royals organization. In eight minor league seasons he was 36-42 with a 3.36 ERA in 195 games.